This was 8 weeks of new friends and experiences, but most of all a total immersion into a new world of music. For better or worse, I wound up as concertmaster of the BUTI orchestra, learning as much as I could not only from my colleagues and Victor Yampolsky (our regular conductor), but also from the numerous guest conductors, including Colin Davis and Leonard Bernstein. But it was Joseph Silverstein who really captured my attention on a regular basis. I was fortunate enough to play in one of his master classes, took a few lessons, and saw him play as much as I could that entire summer. He was a brilliant artist and human being of stunning depth; it seemed as if he could do anything- a great soloist, chamber musician, and pedagogue all rolled together. His broad musicality and ferocious intellect were something to behold, and I began to seriously think about what “being a musician” really meant. Thanks to his inspiration that summer, a whole new world of possibilities seemed to open up. I went back to San Diego and tested out of my ridiculous public high school that December. And I started practicing (a lot) and often had bi-weekly lessons. Things changed quickly. I returned to Tanglewood the following summer as well; over the next 30 years our paths occasionally crossed, and I continued to marvel at his musical and intellectual scope, along with the sheer diversity of his activities. 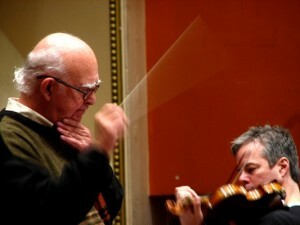 To me he’d redefined the definition of “concertmaster”, and in the process inspired a generation of violinists. 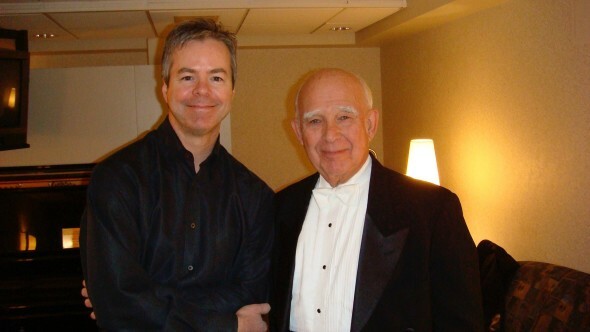 In 2007 I had the good fortune to be the soloist for his guest week at the Milwaukee Symphony, performing the Bernstein Serenade, a piece he’d no doubt performed dozens of times. Although slightly intimidated, I certainly couldn’t have asked for a more informed collaborator for those concerts. I took him to lunch one day, and as usual he was full of wonderful anecdotes and insights on practically any topic; he was in his 70s, and practically a walking encyclopedia. At one point we discussed the gargantuan changes in the music business since we’d met in 1979 (this included him jokingly chiding me for not playing the second half of the program just because I was the soloist, reminding me that was not the policy at the BSO when he was there). Towards the end of our meal I sincerely thanked him for mentoring me in many ways over a few decades, even if he hadn’t realized it. He laughed and (as I recall) told me to go practice a little before the concert. His death this weekend no doubt has many people reflecting on their shared artistic experiences thoughout his long and varied career. To me he was a singular figure at a critical point in my teenage years, artistically and otherwise. I consider myself blessed to have shared the stage with him a few times in my life, but more importantly to have learned so much from him beyond the music, over a period of several decades. Of course he was one of the world’s great violinists. But he always seemed to be driven by excellence and integrity both as an artist and a human being- to me, an example of what a musician should be. I’ll miss him. Great inspirational story! In reading who taught Joe Silverstein and how he was a big influence on my sister, and all the great teaching and mentoring she did, I see a direct line in the influence down to many of today’s violinists. Next time I drive to Chicago, I am coming through Milwaukee to say hi. Great story Frank ! I truly enjoyed reading it, as another admirer of Mr. Silverstein’s…Thanks for posting!